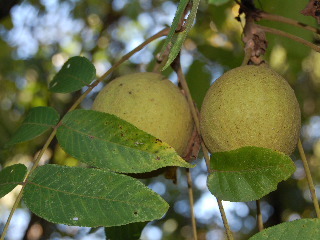 The black walnut tree (Juglans nigra) is a forest tree of the eastern United States, often useful in landscaping, and known for producing a generous crop of nutritious nuts. This towering tree (it can reach heights of 125 feet and more) is a fast growing, long-lived species which usually does well in moist soils and thrives in a forest environment, often stretching its crown above the tops of the surrounding mixed stand of other varieties of hardwood trees. Other times, large black walnut trees will be found growing at the edge of a forested area. The reproduction of the tree depends most often on the nearby rodents, particularly squirrels, which utilize the nuts of the black walnut trees as a food source. Since squirrels are known to bury more nuts than they consume, the little varmints are actually the “Johnny Appleseed” of walnut trees, scattering and planting seeds and perpetuating the species as they go about the food-gathering and food-storing business of their daily lives. And although the busy little squirrels are doing a favor for the big trees, this nut-planting activity is sometimes a nuisance to nearby homeowners, as the four-legged farmers sometimes dig into flower pots on the patio and scatter dirt everywhere or uproot the desirable potted plants in the course of burying the walnut seeds. Also, the squirrels sometimes bury walnuts in landscaped areas, causing seedlings to spring up in unwanted locations such as your well-mulched flowerbeds. If you do want a black walnut tree added to your home landscape, this is often a great way to get one; just watch for a seedling to appear from a “squirrel-planted” black walnut, dig it up, and transplant it to the location you desire. The towering beauty of the black walnut tree makes it a magnificent stand-alone specimen in your landscape. 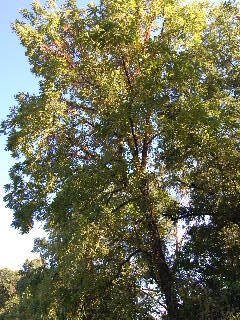 The compound leaves, somewhat yellow-green in color, and the fast growth of the species, make the black walnut a desirable shade-producing tree. Just be sure you give the tree plenty of room to grow and spread, and don’t plant anything else too close to the black walnut as its roots give off toxic juglone, the tree’s natural way of eliminating competition from nearby growing plants. As the tree ages, it develops an attractive furrowed bark, dark brown to black in color. The nuts are surrounded by a spherical, greenish-yellow husk, which turns brown and then black as it dries. The shell of the nut is somewhat woody and corrugated and extremely hard (you often need a hammer, rather than just an ordinary nutcracker, to break open the shell of the black walnut). On a commercial basis, the wood of the black walnut tree is extremely valuable in the production of cabinetry and fine furniture. Its rich-brown, close-grained texture finishes to a beautiful luster, creating pieces of great elegance, notably formal dining tables, china display cabinets, and desks. Whether living a natural existence in the pure forest environment or adding grandeur to your home landscape, the black walnut tree is a stately giant worthy of recognition.